I've not found any Metropolitan Drinking Fountain and Cattle Trough Association cattle troughs in Hammersmith and Fulham. If you know of any cattle troughs in Hammersmith and Fulham please send me details. In July 1901 a 9ft 6in trough  was erected at Goldhawk Road, Hammersmith. In July 1902 a 9ft 6in trough  was erected at the junction of Latimer & Bramley Roads. It was given by Miss C.F. Kirby and included the inscription: “C.F.K. QUEEN VICTORIA 1901”. In December 1904 a 9ft 6in trough  was erected at the junction of St. Peters Square & King Street. It included the inscription “In memory of the horses fallen in the South African War 1900-1902”. On 12 September 1935 a 9ft 6in trough  was erected at Roseford Gardens, Hammersmith. This trough may have been moved to Shepherds Bush Green. In July 1891 a 9ft 6in trough  was erected at Wood Lane/Wormwood Scrubs. The gift of Mr George Mabert. In May 1882 a 9ft 6in trough  was erected at Queen’s Street, Hammersmith. The gift of Mr. Stephen Wright, it was possibly removed in 1936. In March 1887 an 18ft trough  was erected at the east end of Shepherds Bush Green. The gift of Miss E.Gotobed, it was removed because of traffic congestion in Sept-1935. In October 1886 a 9ft 6in trough  was erected on Eelbrook Common opposite Wandsworth Bridge Road. It was removed & re-erected near a school in February 1893. The gift of Mrs Greenhough it may have been destroyed in 1941. In April 1891 a 9ft 6in trough  was erected in Fulham Road near Moore Park Road. The gift of Miss Patterson it was located near the Veitch Memorial (???). In November 1895 a 9ft 6in trough  was erected at the junction of North End Road and Gibbs Green. The cost was defrayed by James Willis Esq. Are there any more Metropolitan Drinking Fountain and Cattle Trough Association drinking fountains in the London Borough of Hammersmith and Fulham? 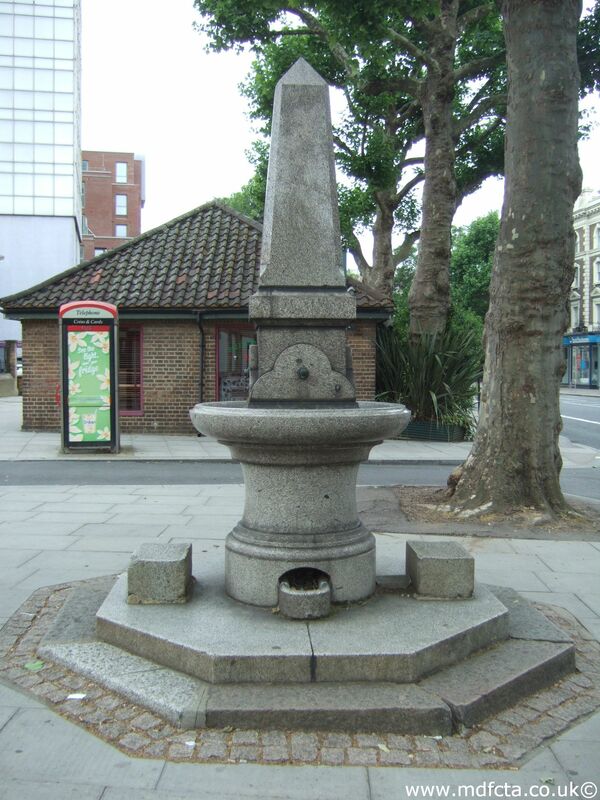 If you know of any other drinking fountains in Hammersmith and Fulham please send me details.